Many say that the year 2018 did Ariana Grande justice. From releasing her 4th studio album, “Sweetener”, and featuring on the Billboard Hot 100 for many of the album’s songs. However, Grande is not done yet. On November 3rd, the song “thank u, next” was released. 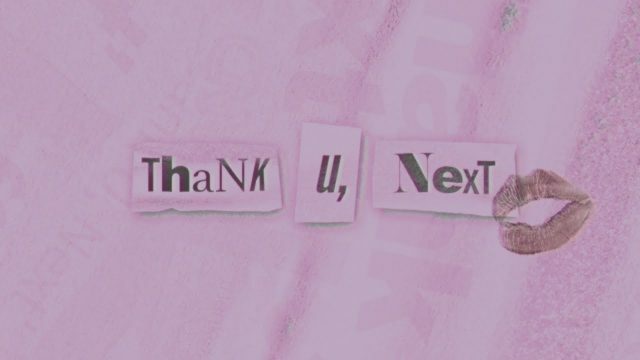 The song, “thank u, next” addresses some of her most infamous past relationships, and how she learned different lessons from each of them. Some of her exes that she mentioned in the song were Big Sean, Ricky Alvarez, Pete Davidson, and Mac Miller. When it comes to Big Sean, they were in a relationship for about 8 months and called it quits but, are still in touch simply as friends. Ricky Alvarez, who was one of her backup dancers dated her for around a year but kept it all low-key. The lyrics written for him are, “Wrote some songs about Ricky. Now I listen and laugh”. This lyric talks about how in her “Dangerous Woman” album, her friend and co-writer has said that the first song of the album, “Moonlight”, was written about him. The next person mentioned in the song was her most recent relationship and ex-fiance, Pete Davidson. Many know about their relationship for many reasons, but one of the more well-known reasons was how their relationship accelerated within a span of 3 weeks. It is known that after getting into a relationship, three weeks later the couple got engaged. A few months later, the two split and did not proceed with their marital plans. The last relationship included was the one she shared with Mac Miller, which lasted for about two years. The lyric, that she wrote for him caught many fans with “the feels” and reminded them of memories when they were still together as the lyric stated, “Wish I could say ‘Thank you’ to Malcolm. ‘Cause he was an angel.” Sadly, this September, the hip-pop artist Mac Miller passed away from an overdose, and it affected Grande as they were very close to each other even after their breakup. Other than addressing her ex-relationships, Ariana Grande talked about self-love. In the song she stated, “Plus, I met someone else, We having better discussions, I know they say I move on too fast, But this one is going’ last, ‘Cause her name is Ari” This lyric shows how she doesn’t need someone else to have fun and feel like her best self, and that she is independent, which is a very important message for many teens. Ariana has expressed that this song has no shade intended or was made to make anyone look bad, but is just showing how these people have taught her many things, and how she thanks them for that. As we know that relationship with Pete Davidson is still bumpy, we do not know what to expect on how he perceived the song. As of now, “thank u, next”, is breaking many records, as it became the fastest song ever to surpass 100 million Spotify streams. Also, the lyric “thank u, next” is now a meme and a quote, that has been used by many, like actor Mark Hamill, and even the singer herself. The song has been performed on The Ellen Show and was sung with two backup singers. While singing the new hit, the background was themed to a wedding and everyone singing was dressed in white, making a simple nod to the wedding that was broken off not too long ago. As the song tops charts all over the globe, the song spread the message of valuing experiences, self-love, and worth, learning from the past, and looking forward to the future.